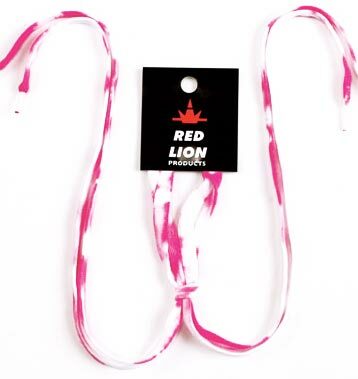 These bright & colorful Tie Dyed Shoe Laces from Red Lion are fun and fresh and are sure to add lots of flair to any pair of shoes! Please Note: There may be some Color Bleeding and/or Color Variation from the Tie-Dye process, and No Two Shoe Laces Will Look Exactly The Same. 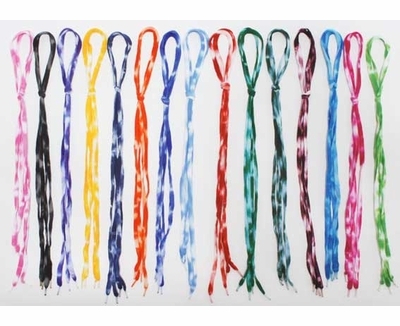 Tie Dye Shoelaces have an original knit length of 45" in length (but some shrinkage occurs during the dying process) - these shoe laces will fit most shoes & sneakers. Tye Dye Shoelaces are available in all your school Colors: Black, � Purple, � Gold, � Navy Blue, � Orange, � Royal Blue, � Light Blue, � Red, � Kelly Green, � Dark Green, � Maroon. Also available in 3 NEON Tie-Dye Colors: � Neon Blue, � Neon Pink, � Neon Lime Green. Note: All Tie-Dye Shoe Strings are White with One Color dyed into the shoelace. These are cute and look great with black cleats!